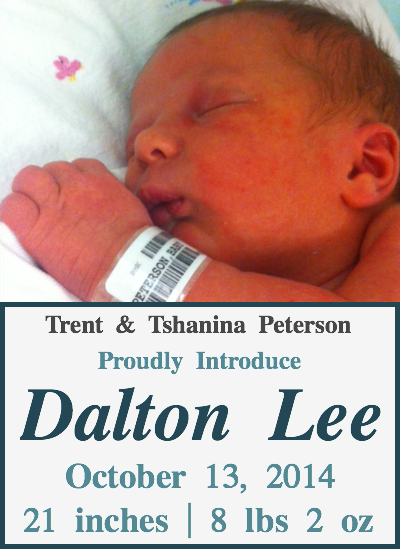 Dalton Lee arrived on October 13 at 8:36 p.m. weighing 8 lbs 2 ounces and measuring 21 inches long. The Lord truly blessed us with an uneventful delivery. 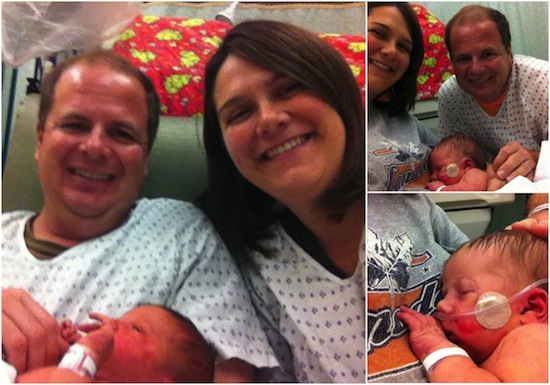 Once Dalton arrived he was having problems breathing and was quickly whisked away to the NICU. He was placed on a CPAP machine and monitored for fluid on his lungs and an infection. On his second day in this big world his CPAP was removed and replaced with a cannula to help him breath (definitely a step in the right direction). We learned that he did, in fact, have an infection and he was quickly treated with antibiotics. His cannula has since been removed and he’s still being treated for his infection with hopes of coming home soon! I wish there was a fabulous story behind Dalton’s name but there’s not. With a name as unusual as mine, you can imagine how difficult it was for me to choose a name. My criteria was that his name couldn’t start with a T, couldn’t be shortened (for a nickname), and it had to be something that you could pronounce when you read it. After looking through about three baby name books I came up with a list of around ten names. I showed them to Trent and we narrowed the list down even further and landed on two that we agreed on. His middle name is near and dear to me because it was my dad’s middle name too. It was easier picking his middle name than his first and I knew pretty quickly that’s what I wanted. Trent’s already given him his first manicure (top right picture) and Dalton loves to cuddle with his daddy. I’m so very blessed with my precious husband. He’s been such a huge support, encouragement and help not only through the entire pregnancy but afterwards as well! I’ve affectionately given him the name Nurse Kratchet because he’s “encouraging” me to drink my water allotment. I definitely need all of his reminders, but that’ll just be our little secret! If you’ve been following along as I share updates about my surprise pregnancy journey, I shared that I’d probably be in shock until the baby came. Well, he’s here and I’m still in a bit of shock (and I’m okay with it). As odd as it may sound, being a mother is a strange feeling but I’m going to be the best mom I can be! Whether you’ve prayed with us since the very of the beginning of this pregnancy or just started today, we are ever grateful for your prayers. We’ve definitely felt them during this time – so thank you! You’re so lucky to have that Nurse Kratchett! :) glad to hear Dalton is improving. I definitely am, Sarah! He’s been such a blessing and such a huge help to me! Congratulations! He is beautiful. He has wonderful parents. Love his name. Best wishes on your beautiful son! Love the name and your happy pictures here. So happy to hear your family is all doing well! Congratulations! I figured that’s where you went when you were quiet last week! Congratulations! He is absolutely precious! And he shares a birthday with my Lukey :) It’s a great day to have a baby! Congratulations again! And praying that he gets to come home with you soon! Congratulations! I love how happy all the pictures are. I just know you are happy beyond measure. Prayers for rest, peace, and wisdom. 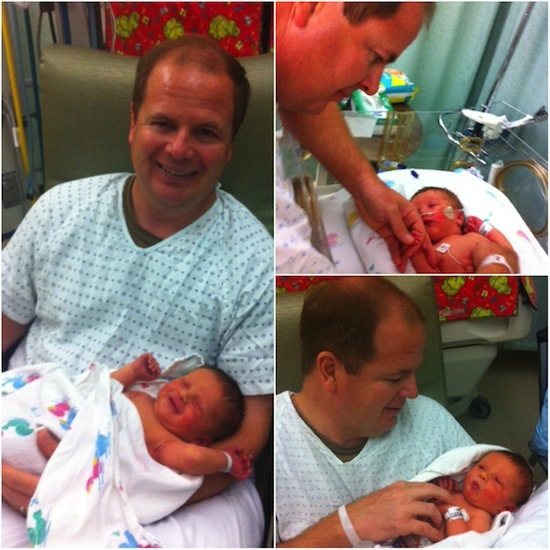 I have been following you and I delivered my surprise gift on October 14, 2014! Also a boy! This is our 4th blessing my other kids are 19, 14, and 9. Your feelings are/were exactly what I was going through! Now I cant imagine life without him! Jenness, congratulations on your precious baby boy! I’m happy to hear that my feelings resonated with your heart – that’s definitely why I shared them.